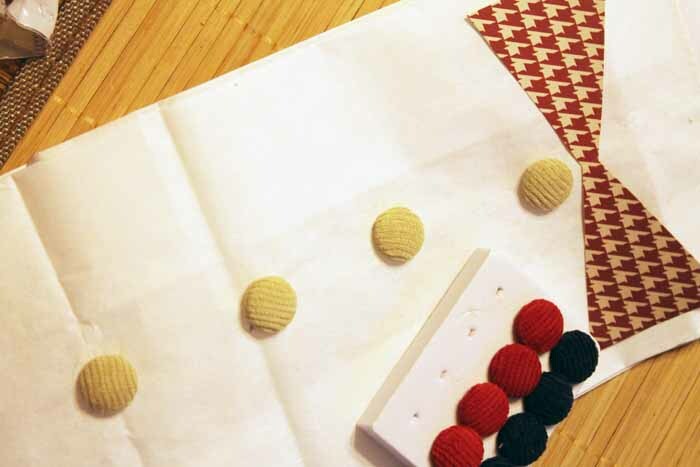 You can make a fall tray with buttons with this craft tutorial. I am in love with this tray. It is sturdy and gorgeous which is the perfect combination. Yep it is a thrift store makeover as well so it didn’t cost me much to make. 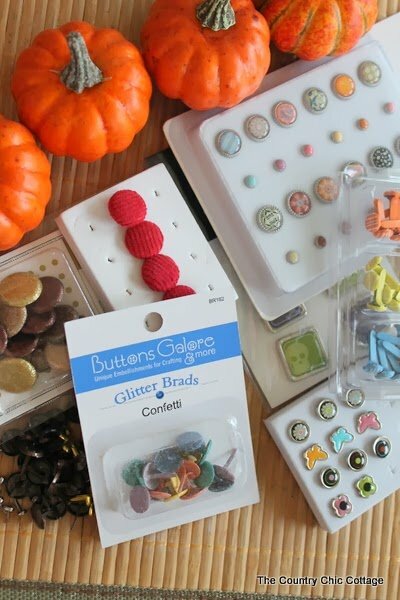 Grab your button stash and lets make a great fall tray with them. I am off to SNAP! 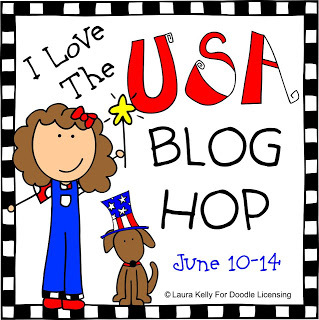 Conference this weekend but I have scheduled a few fun posts for you while I am gone. 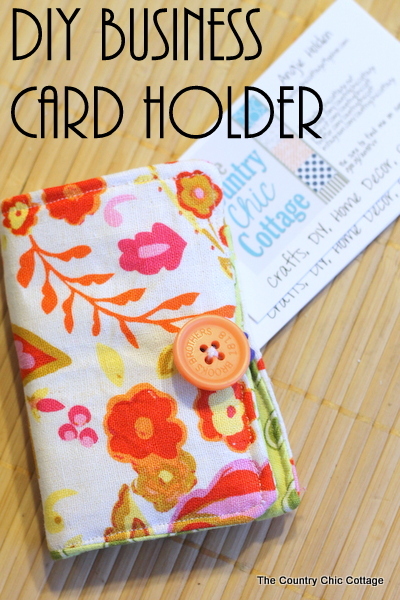 The first is my DIY business card holder. This will make my cards look great while giving them away this weekend. Don’t fret I will be back next week with a recap of my fun times at SNAP! plus some more projects that are related to the trip. Can you believe that graduation time is approaching once again? 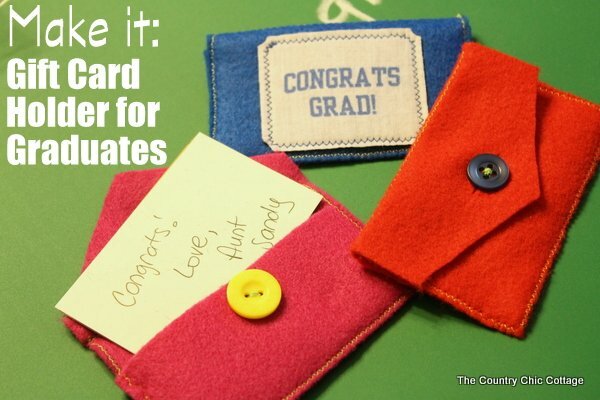 I have a handmade gift card holder for graduates today that you can whip up quickly. 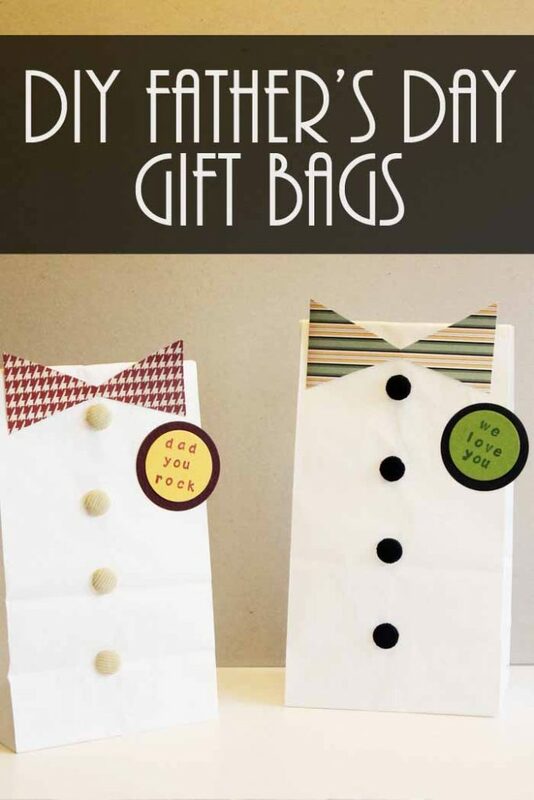 The perfect gift for any loved one that is taking the big walk this spring. 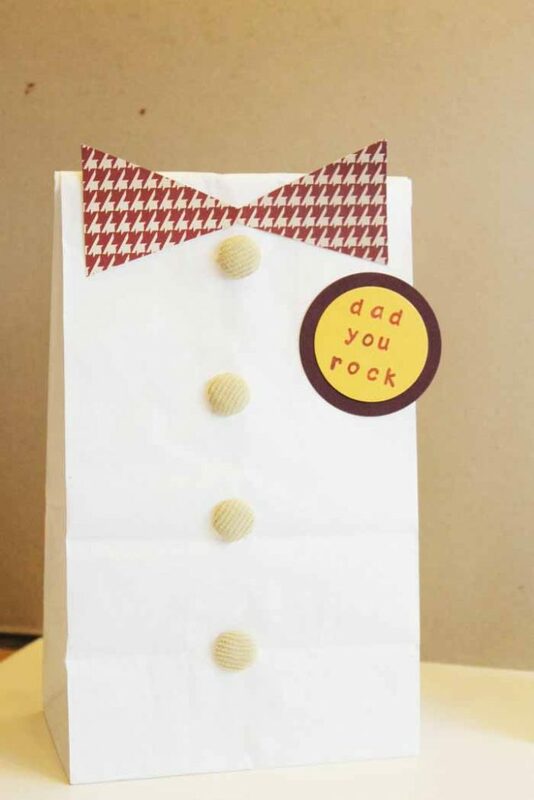 Personalize the front of this gift card holder depending on your recipient. Plus what graduate does not want a gift card for a gift? They all do right? 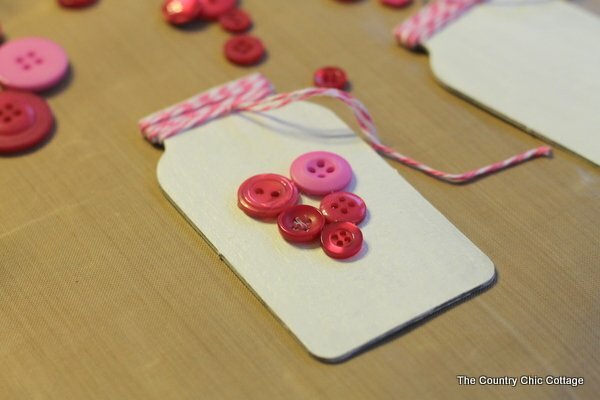 This tutorial was originally posted over at Buttons Galore and More last year but the idea is great for this year as well. 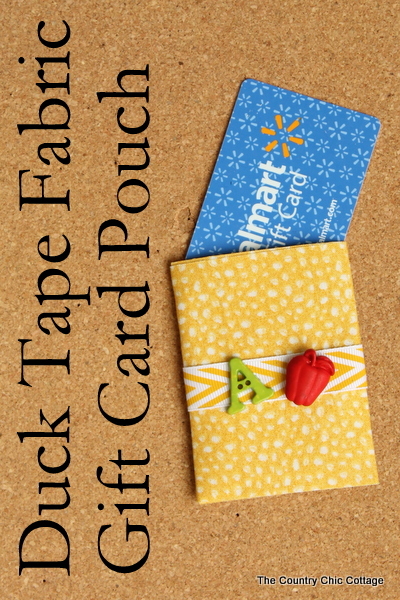 My next quick craft for Teacher Appreciation Week is this duck tape fabric gift card pouch. Did someone say duck tape fabric? Yep! 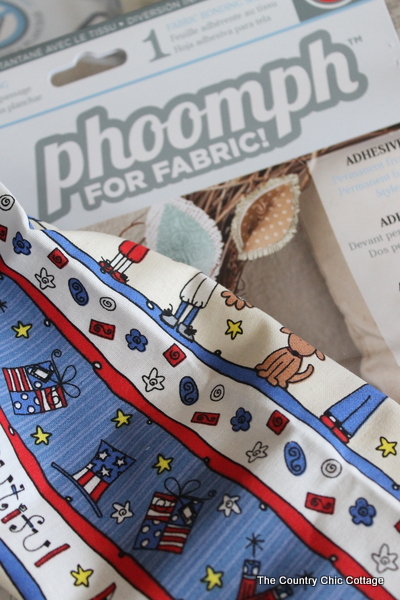 They made adhesive fabric on a roll now and it is awesome. 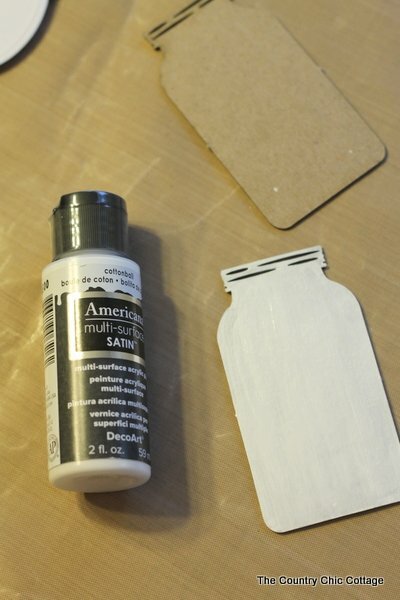 It is perfect for quick crafts y’all. 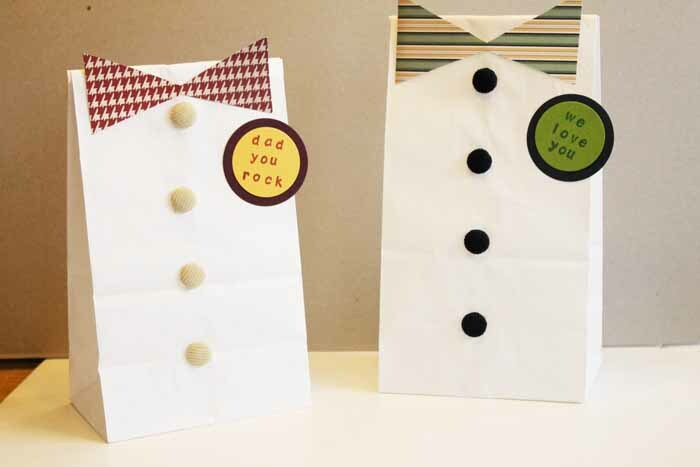 Before we get started if you have missed any of the quick crafts for Teacher Appreciation Week, be sure to check out the round ups from day 1 , day 2, day 3, and day 4. 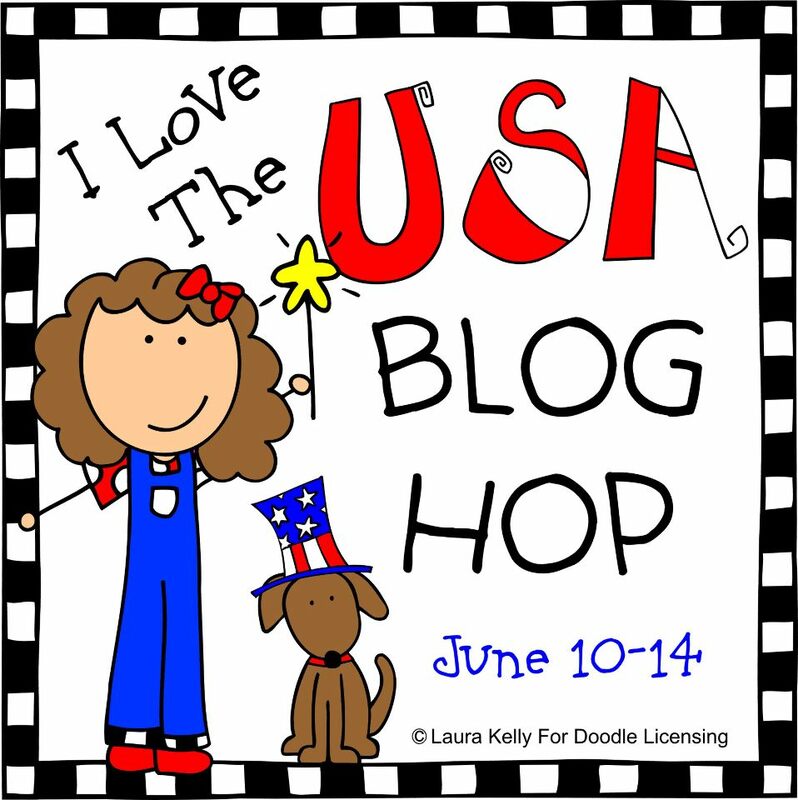 Also if you want a chance to be featured here this week, link up your quick teacher appreciation craft to our Craft Lightning linky party. 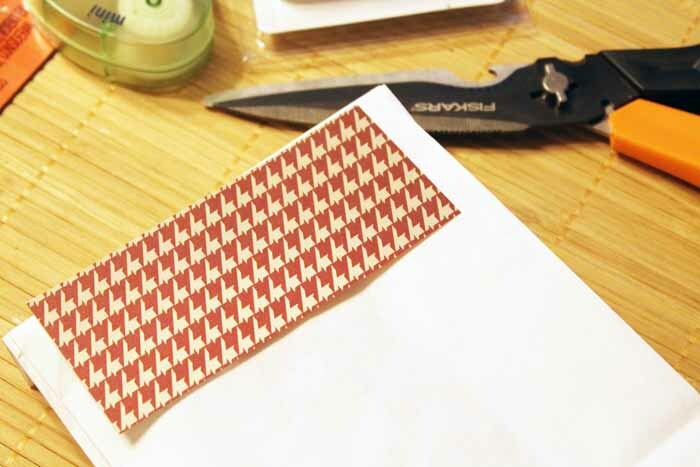 Now lets get crafty with some Duck Tape Fabric! 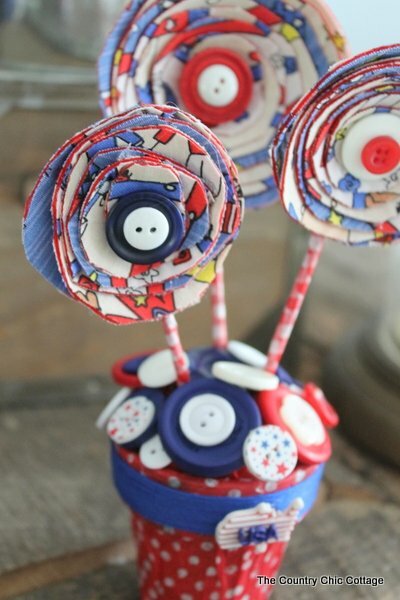 I am here today with my button candy cane Christmas ornaments. 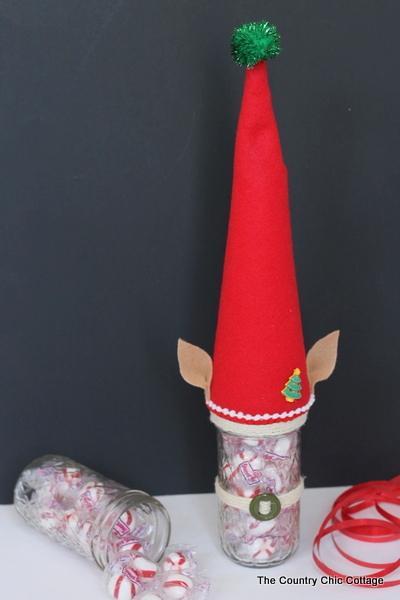 You are going to love this quick and easy addition to your tree. I am joining up over at My Very Educated Mother today for her No Ugly Ornament series. 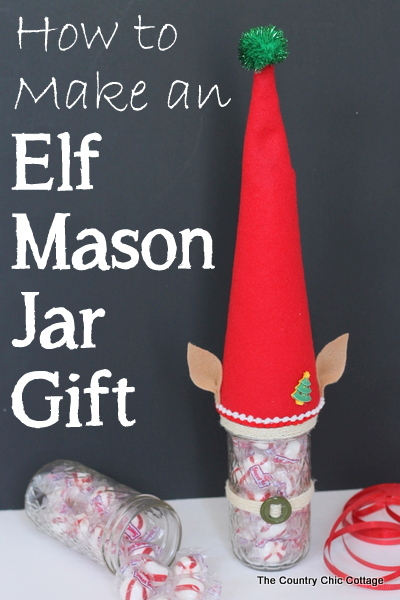 Be sure to head over there after you are done here to see even more ornament inspiration. Now lets break out those buttons! The buttons used for my project were provided by Buttons Galore but all projects and opinions are my own. Start on one end of your floral wire and bend it over with your pliers. I would recommend a 16 gauge wire so your candy cane will hold its shape. Next start adding on buttons from the opposite end. Two red then two white right through the holes in the buttons. Keep them all about the same size. This is where the kids come in y’all. Let them add the buttons on your wire! When you have your candy cane about full, bend the wire by hand while holding the buttons in place with your other hand. When you bend the wire the buttons will move slightly so you want to do this before you finish off your candy cane. 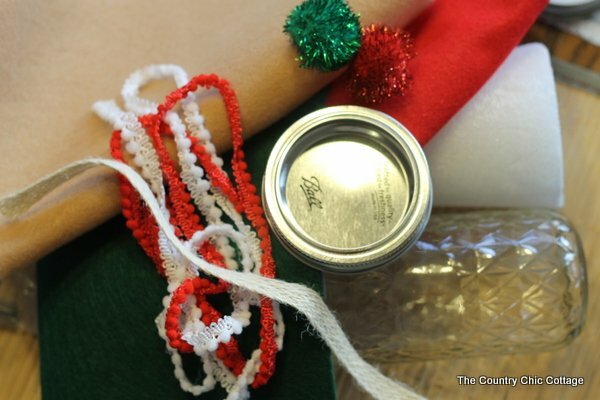 Once your candy cane looks full enough for you, hold the buttons really tight and bend over your wire as shown below. Bend it over to hold everything in place. 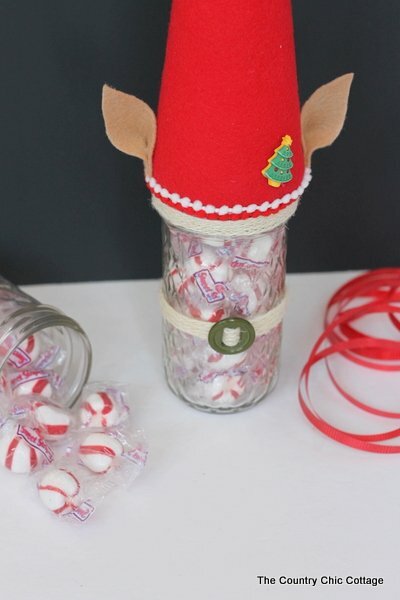 You will have a tree full of button candy canes in no time y’all! Those were easy right? 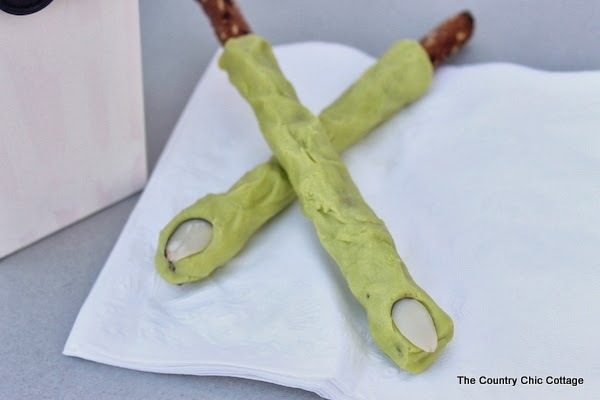 Y’all can make these! Trust me! Now don’t forget to find more fun ornaments over at My Very Educated Mother. 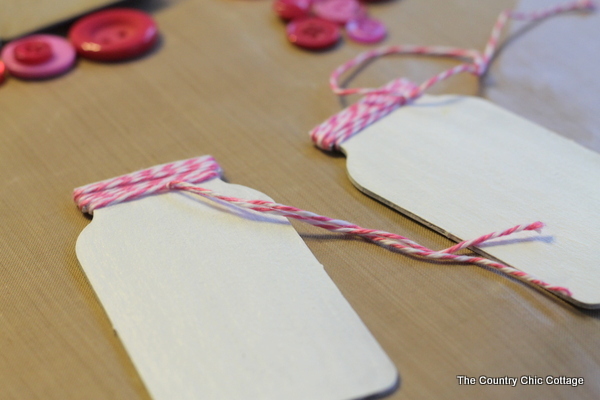 Now is the perfect time to kick off crafting for Christmas.I hope you enjoyed my button candy cane Christmas ornaments. Stay tuned cause I have tons of Christmas fun planned over the next couple of months. 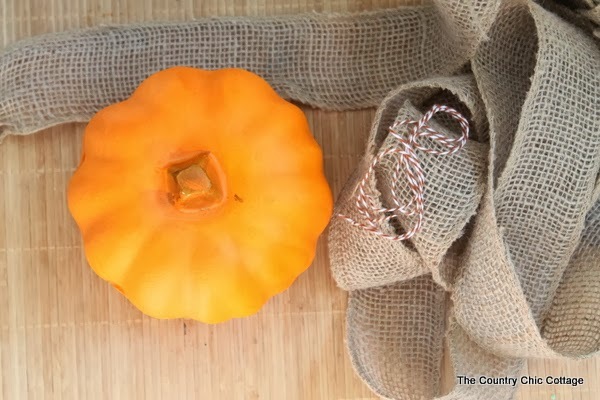 I am back with some more Thanksgiving fun and my rustic burlap napkin rings. 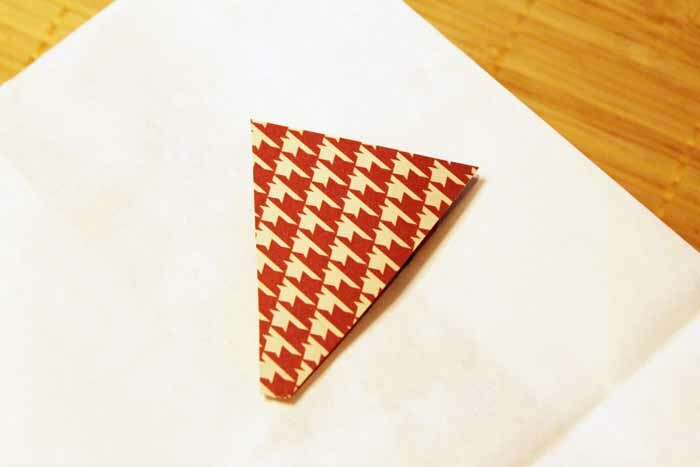 The perfect accessory for your Thanksgiving table plus they are super easy to make. 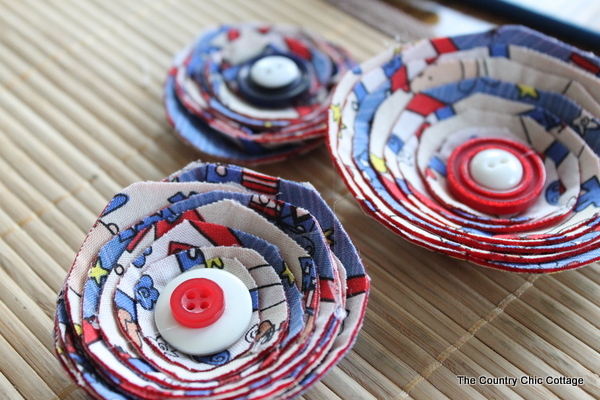 If you missed it, I shared my bottle cap turkey napkin rings for the kids’ table earlier this week. This is a more sophisticated napkin ring for the adults. 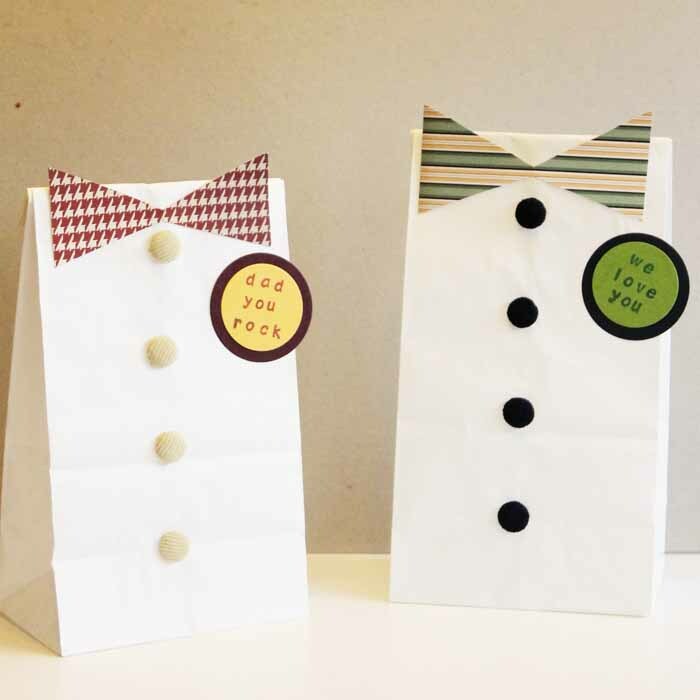 As a bonus, these napkin rings double as place cards as well. You will need a wood burning tool for my version of these rustic burlap napkin rings. Don’t be scared! This was only my second time working with a wood burning tool and it is so super simple and easy to use. Don’t believe me? 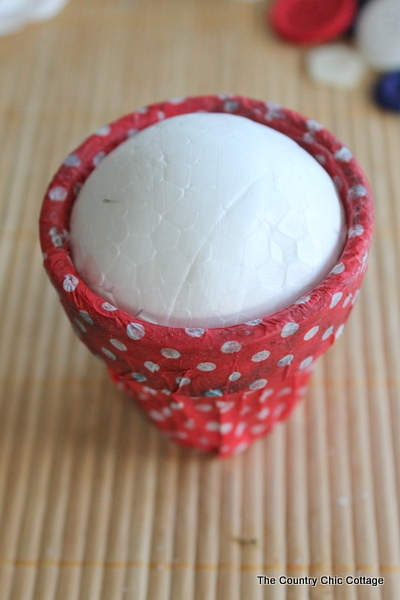 Just watch me LIVE as I make these napkin rings with my friend Carolina from 30 Minute Crafts. Then you will see that burning wood is a piece of cake. 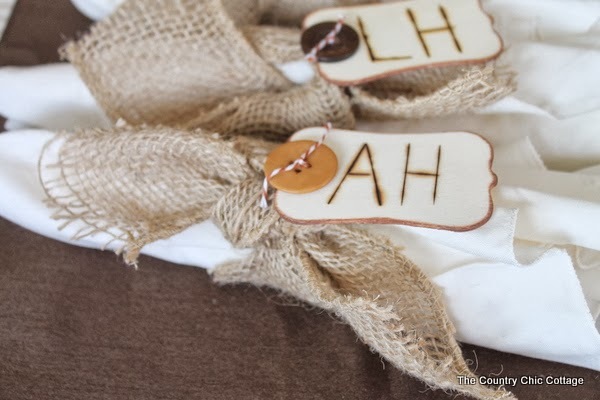 Grab your wood burning tool, wood shapes, brown ink pad, burlap ribbon, baker’s twine, and buttons. Burn the initials into the wood with your wood burning tool. 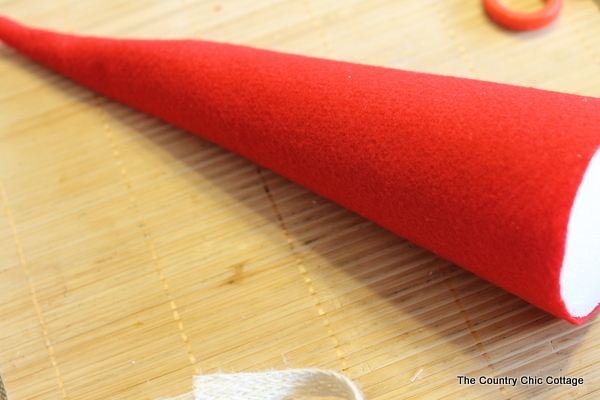 Be sure to follow all instructions and safety precautions with the tool. Rub edges of wood shape with brown ink to distress. 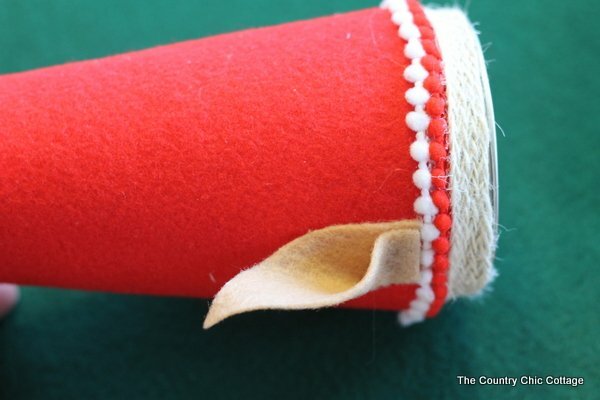 Cut a length of burlap ribbon and tie it around your napkin. 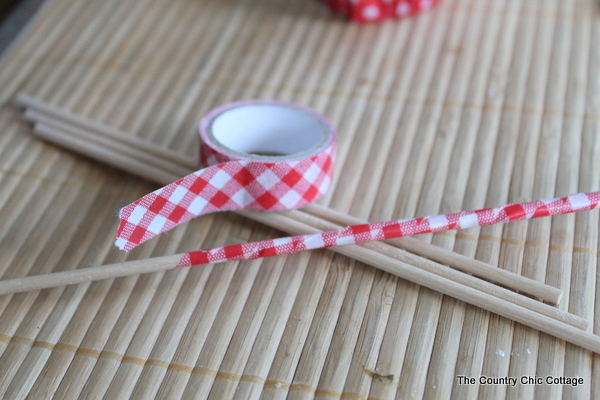 Tie on your wood shape with a bit of baker’s twine and a button. Enjoy your rustic Thanksgiving dinner table! 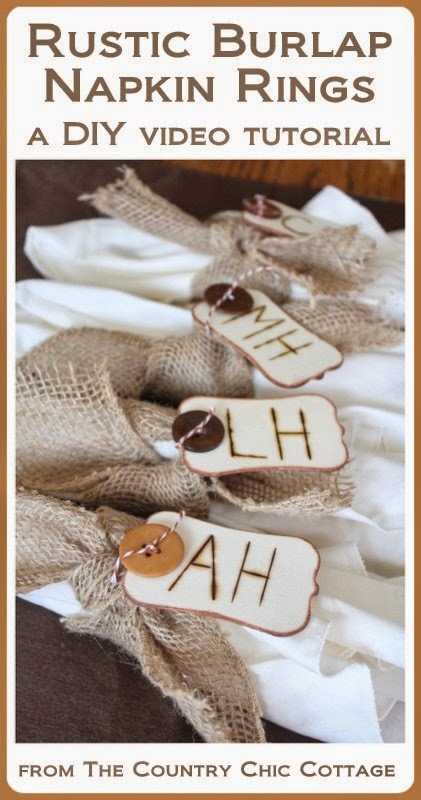 These great rustic burlap napkin rings will be the hit of your Thanksgiving meal. 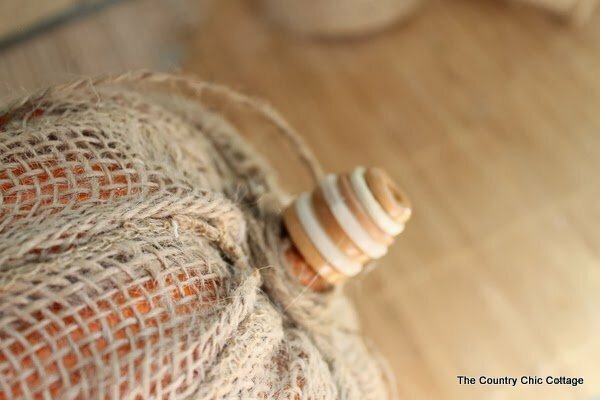 Make a set of these today in preparation for the big day.Don’t forget these would work perfectly with my DIY burlap placemats! 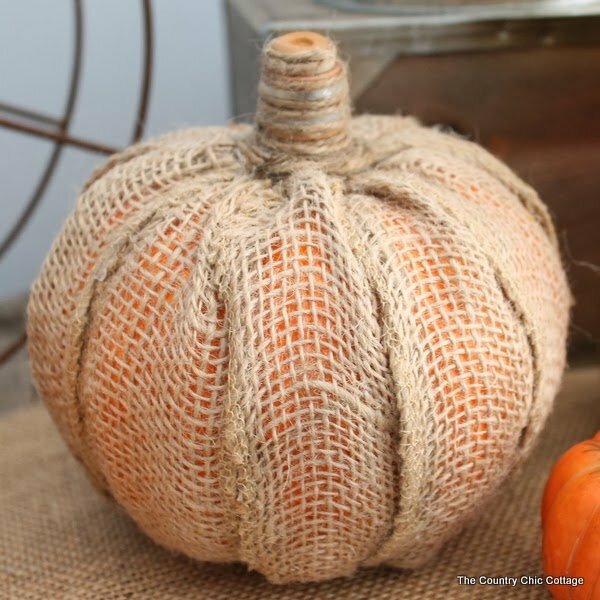 This fall you can make your own burlap pumpkin with this super simple craft tutorial. 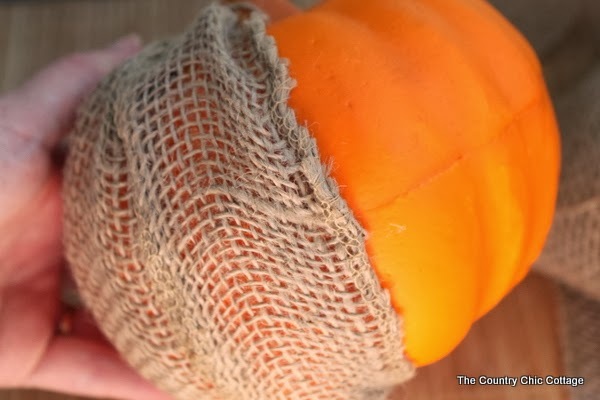 Take a dollar store pumpkin and make it something special in a few minutes and with a few supplies. 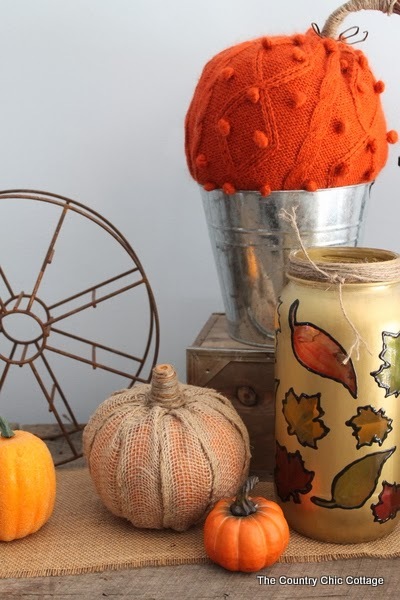 You will love the rustic touch this brings to your fall home decor. Break out those $1 pumpkins y’all! Some of the links in this post are affiliate links which means a portion of your purchase will go to support this site. You need one of those Dollar Tree pumpkins and some burlap ribbon. 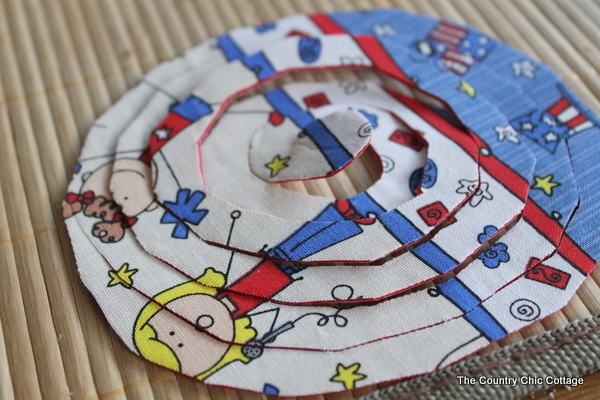 I like using the ribbon because it is finished on two of the edges and that is really what this project needs. 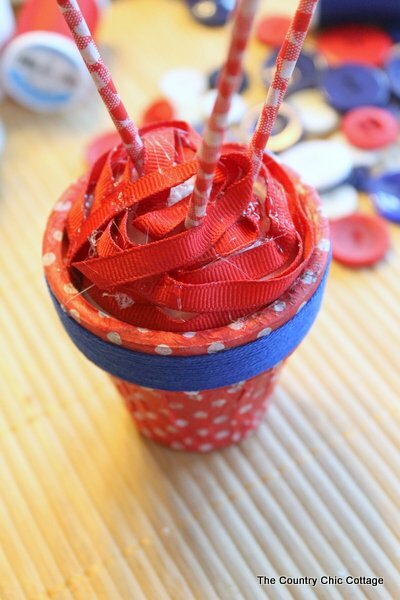 You will also need some jute twine, buttons, and hot glue. 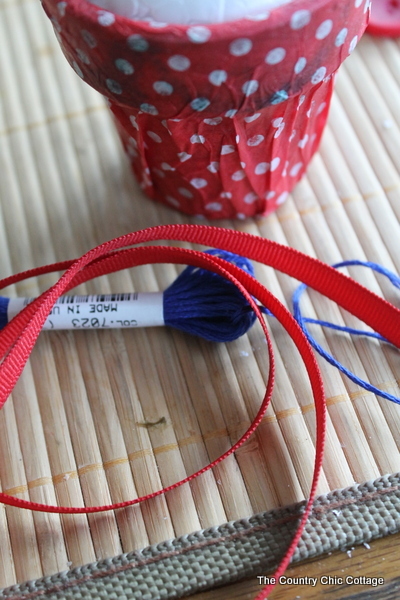 Ignore that baker’s twine in the picture below (that was plan A and plan A did not work). I put hot glue down each “section” of the pumpkin and glued the ribbon into place. So basically the ribbon fit across one section almost perfectly. I forced the ribbon to fit so it is slightly gathered especially at the top and bottom. See the top below. Make the ribbon fit into each section. 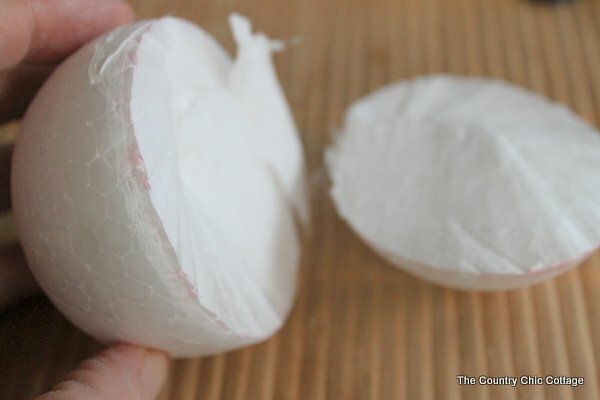 Use hot glue at the top and the bottom as well to secure. 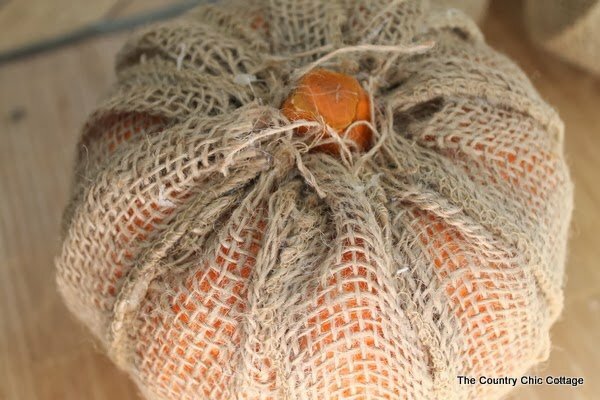 When you are done with the burlap ribbon your pumpkin will be looking a little like the below. WOW! What a hot mess! Never fear! Jute twine is here! 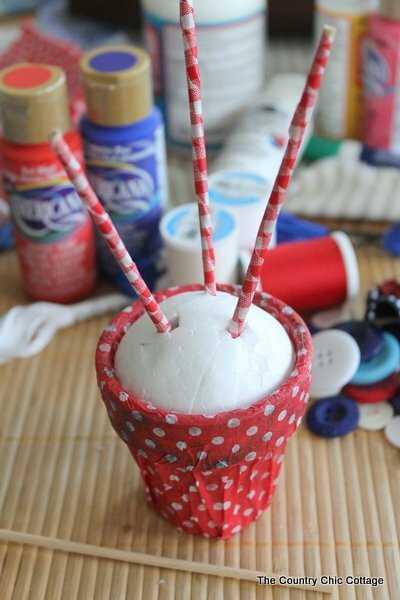 Use hot glue and just twine wrapped in circles to cover up around your stem area. Looking better already! I then grabbed some brown and white buttons to make a stem. 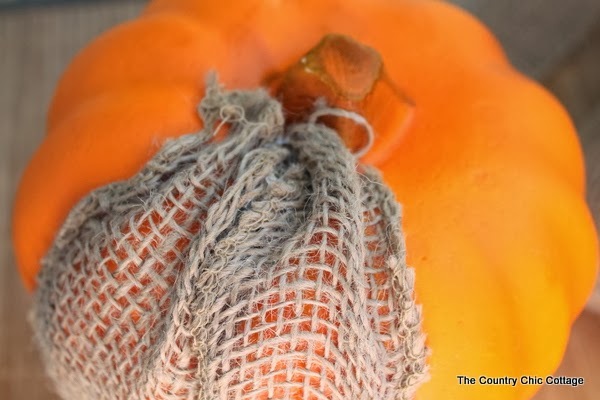 The stem on these little pumpkins is just not substantial enough for me and most of it was covered by the burlap. I just stacked up the buttons on top (alternating colors) and used hot glue to secure. 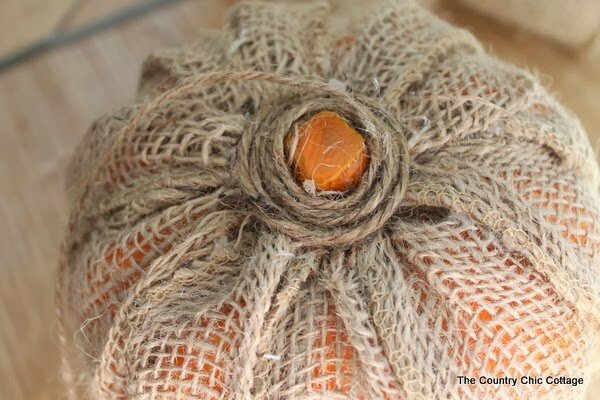 Then wrap the jute twine up where it rests in between the buttons but does not cover them completely. It makes for a cute little stem don’t ya think? 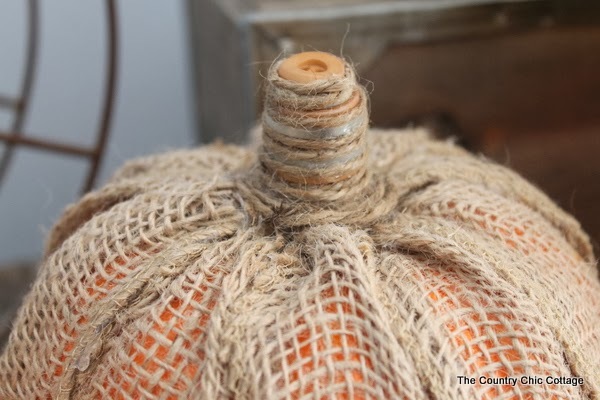 You are left with a burlap pumpkin that is still slightly orange (but not the day glow effect of the original). Plus you can do all of this in just a few minutes. I call that a win win. My burlap pumpkin ended up on my mantle with my fall jar luminary and sweater pumpkins. 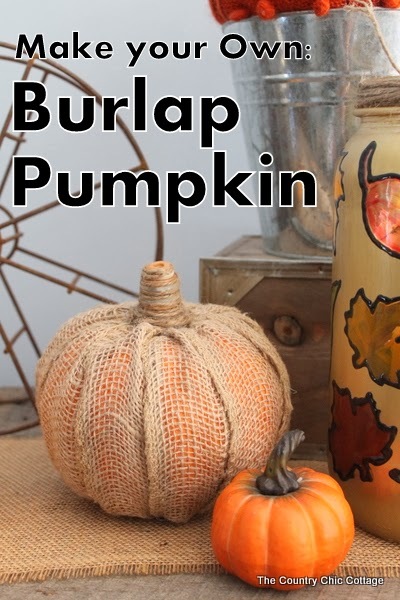 Make your own burlap pumpkin today y’all….you will love it! 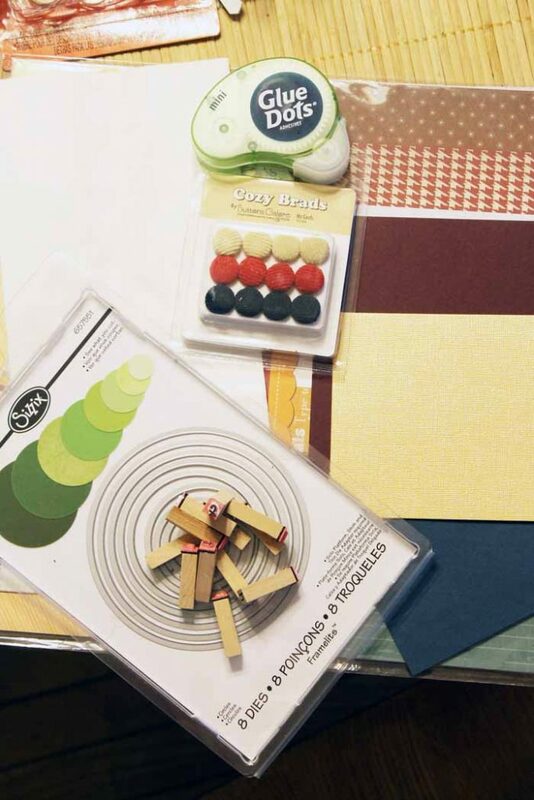 Portions of the supplies for this tutorial were supplied to me by the companies linked. However, all opinions and projects are my own. 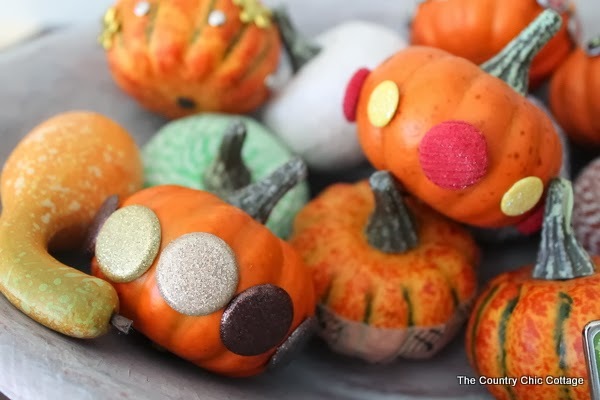 Bradded Pumpkins — a 5 minute way to decorate pumpkins! 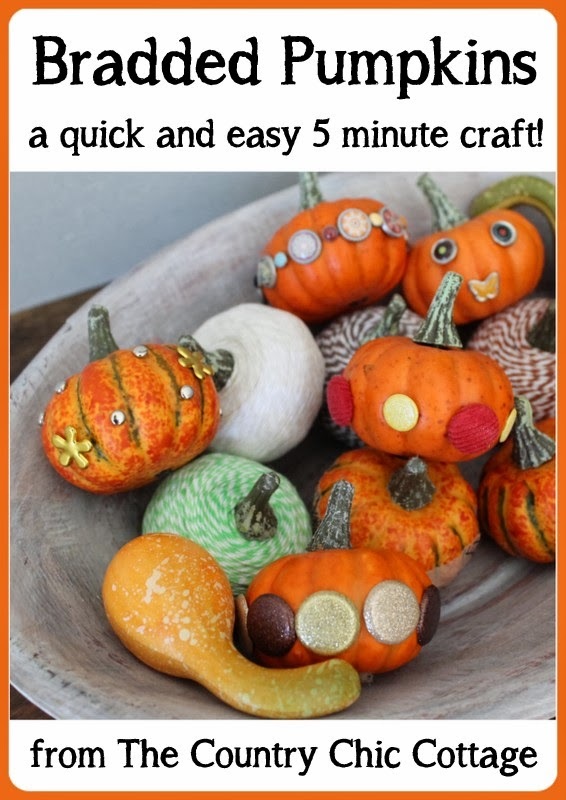 I have a quick and easy 5 minute craft today with my bradded pumpkins. 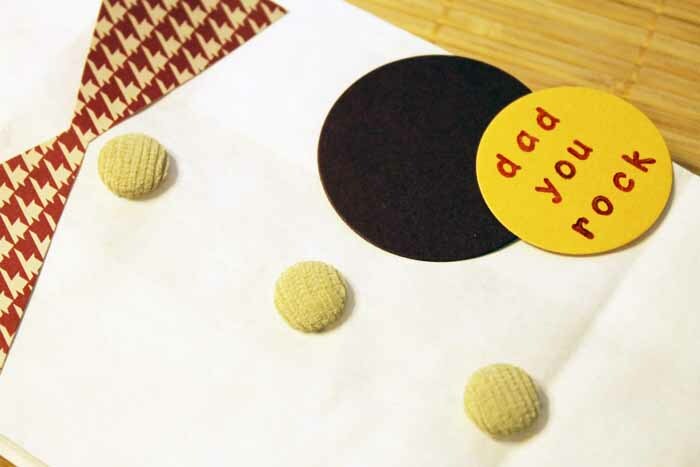 If you are looking for something even the smallest of kids can do….this craft is for you! All week long around here we are doing quick and easy crafts for Halloween with the Craft Lightning super spooky edition. If you missed any of the fun, be sure to check out the features from day 1, day 2, day 3, day 4, and day 5. 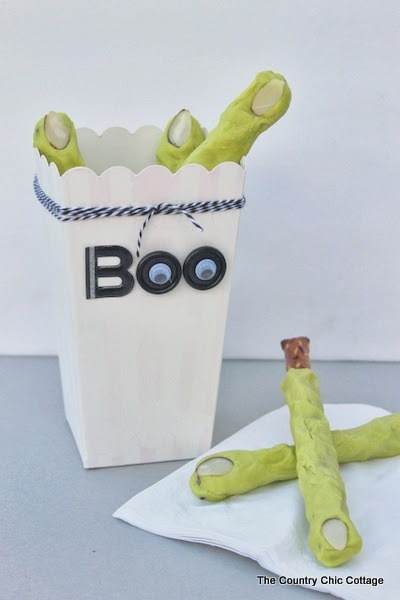 Also if you want a chance to be featured this week, be sure to link up your quick Halloween craft to our Craft Lightning linky party. Now get ready for the simplest pumpkin decorating tutorial you have possibly ever seen. You will need some brads. 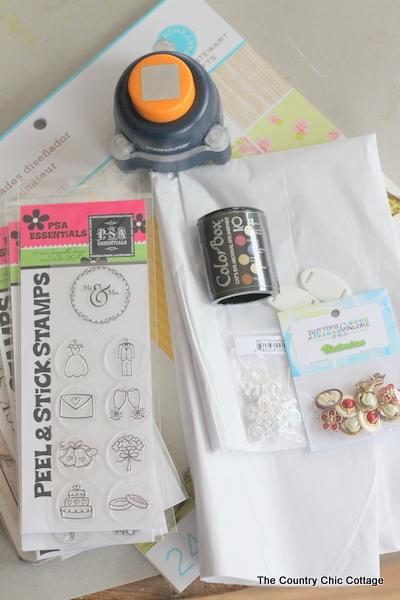 I grabbed some from my stash along with some really fun ones from Buttons Galore and More as part of my designer status with them. Then literally you just push them into the pumpkin. If you don’t know what a brad is you can see that it has a nail like appearance in the photograph above. 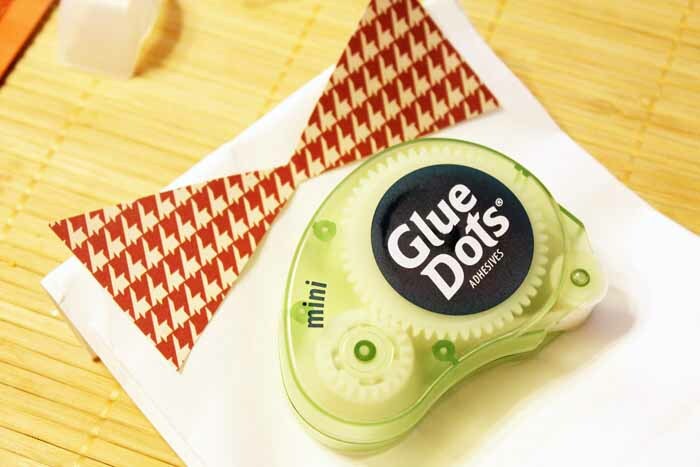 However brads are not sharp and can be used when crafting with kids. So they are perfect! I pressed them into fake pumpkins here but they will work on real ones as well. They are so easy to push in it is almost not like a craft at all! No glue is even required y’all. 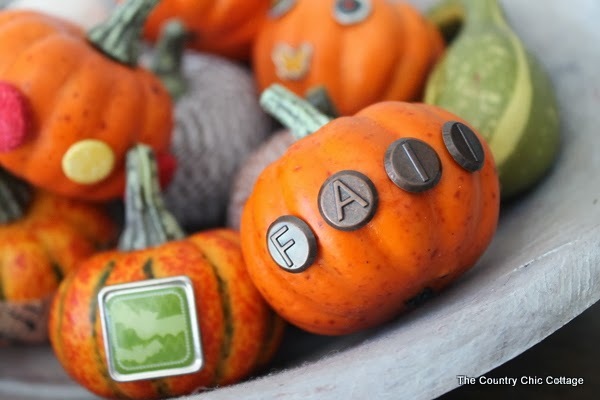 You can spell fall with these antique ABC brads like the picture above. 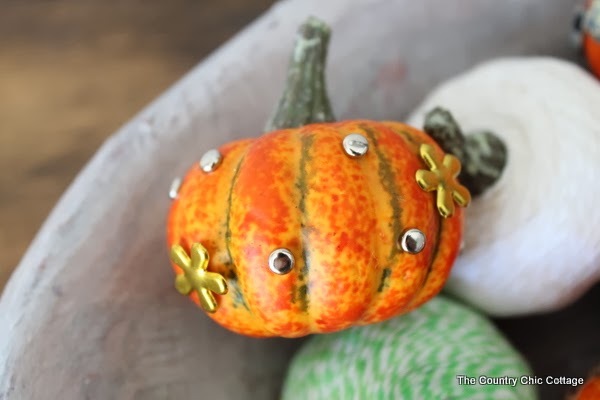 Or grab some fabric and glitter covered brads for some pumpkins like the picture below. Maybe you don’t like the brads all in a line? Just used them as dots all around your pumpkin. Below I used a combination of tiny jewel rounds and jewel flowers. 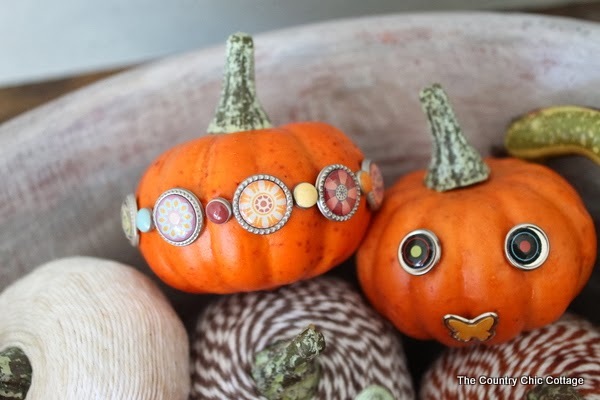 You can even get a little funky with your brads and use them to create a fun pumpkin face. What a fun way to “carve” a pumpkin without ever getting out a knife. The best part? I created all of these in less than 15 minutes. 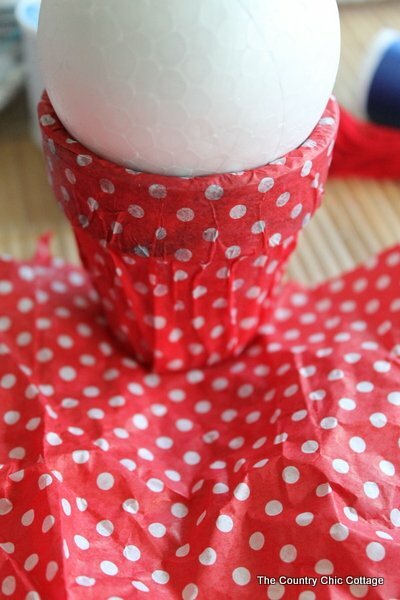 Such a quick and easy craft that there is no reason NOT to do it! 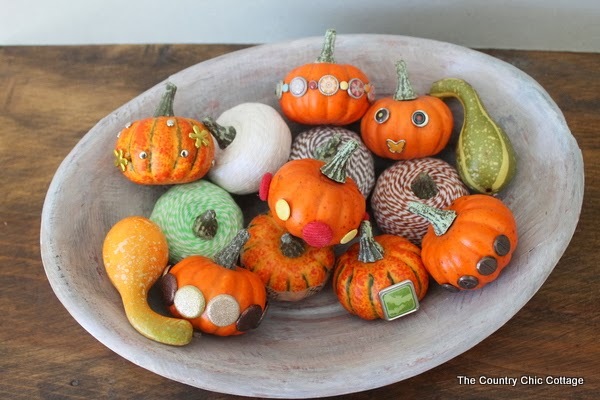 I am displaying mine in a bowl along with my baker’s twine pumpkins. 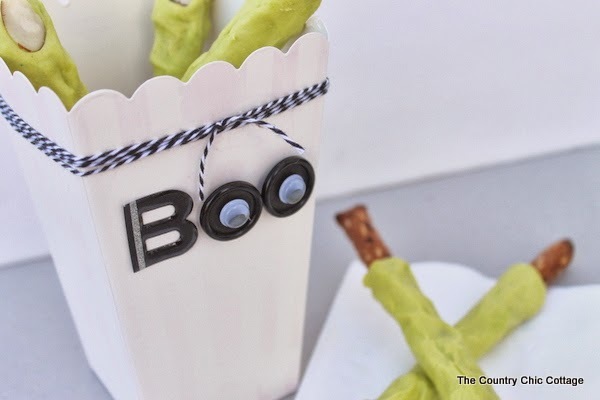 What a fun addition to your fall decor and all in just a few minutes time. 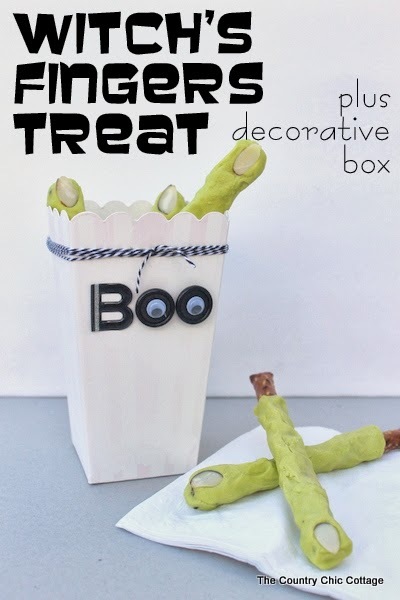 I hope you have enjoyed my bradded pumpkins and will come back all week for even more quick Halloween craft inspiration. Every morning I will have a quick craft for you and every afternoon I will have a set of features from around the web. Fun right? 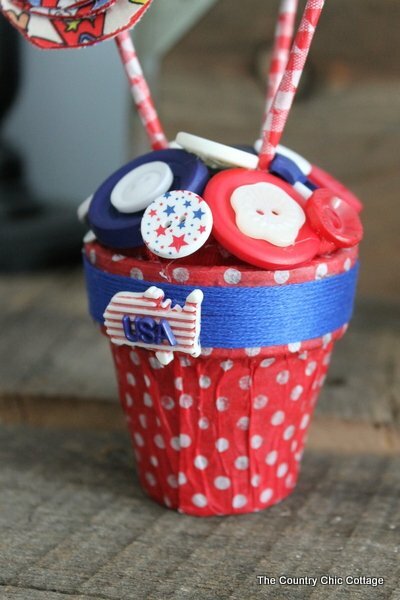 Don’t miss it!I am a member of the Buttons Galore and More design team where I am compensated for my use of their products. All projects and opinions are my own however. 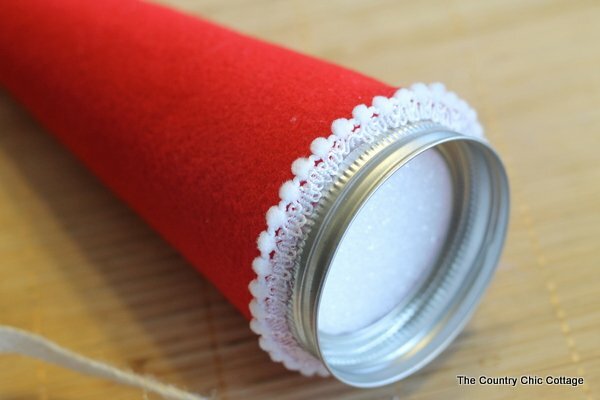 I posted this great tutorial for an embellished pencil pouch over at Buttons Galore last week and wanted to share it here as well. My kids have been back to school a while but I know some of y’all are just loading up your babies for the first time. 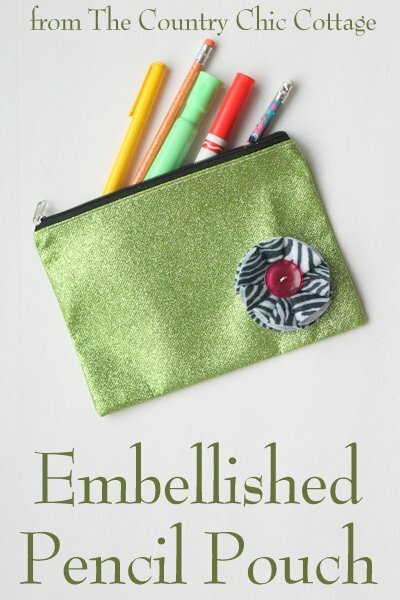 Send them off in style with this cute little embellished pencil pouch. 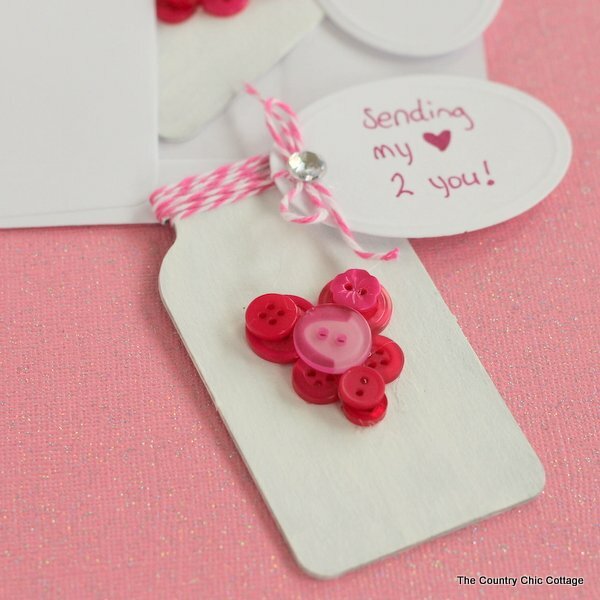 Add a little flair in just a few minutes with my super simple and fun flower embellishment. 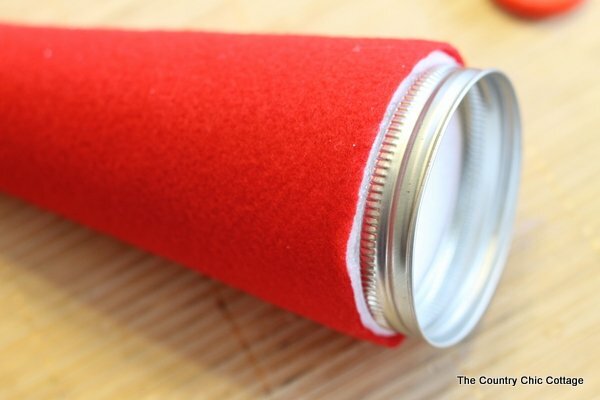 Grab a pencil pouch from the Dollar Tree (hello glitter! ), some zebra felt, and a button to get started. 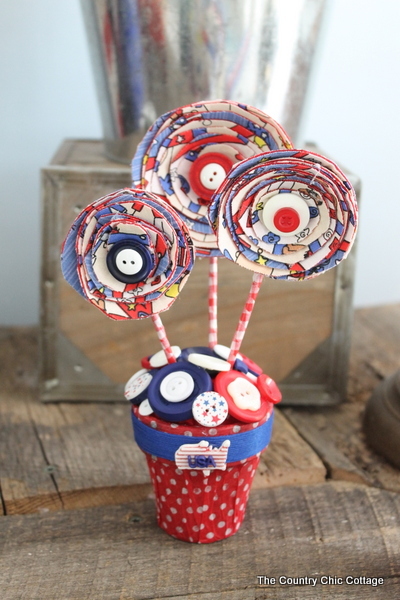 Check out my video below for a full demo on how to make this great craft (in under 4 minutes y’all!!). 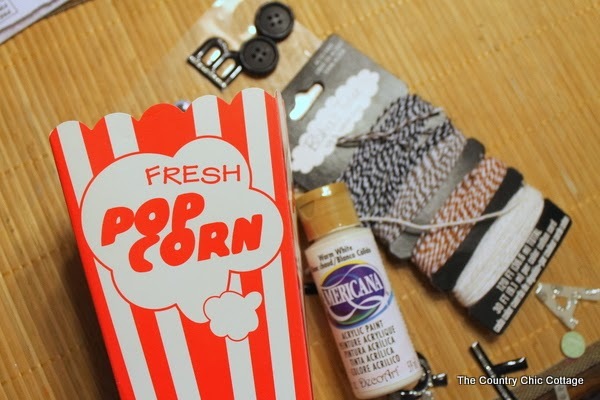 Hope you had fun and will make your own embellished pencil pouch. Here is a close up shot of how the flower looks once completed. So simple yet so darn cute! How many things can you think to add this simple flower embellishment to? 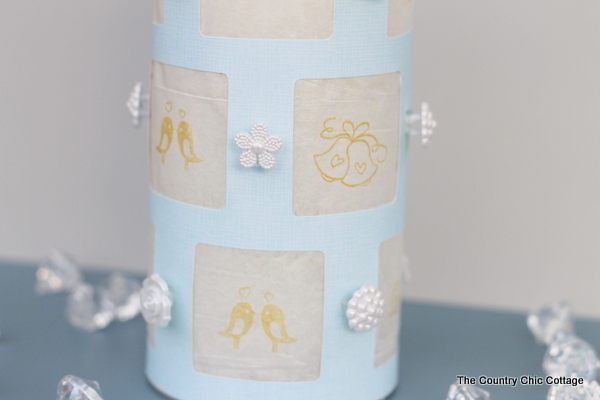 I have a great DIY wedding candle wrap tutorial for you today. First though this week is Craft Lightning week! 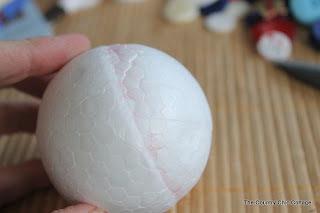 I am joining Carolina from 30 Minute Crafts and each project we post this week will be able to be completed in 15 minutes or less. I will also be doing some features from around the web each afternoon. Would you like a chance to get featured? 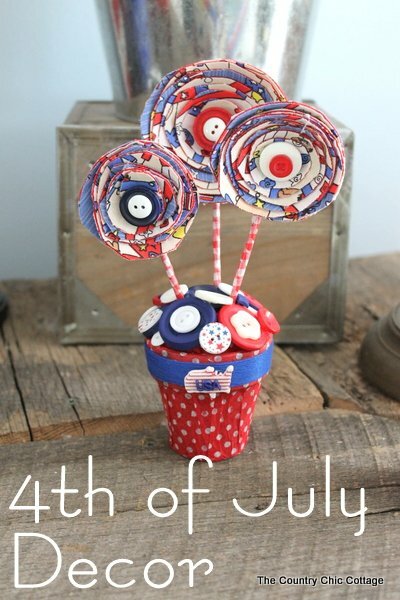 Be sure to link up your quick and easy crafts to the linky party for a shot. 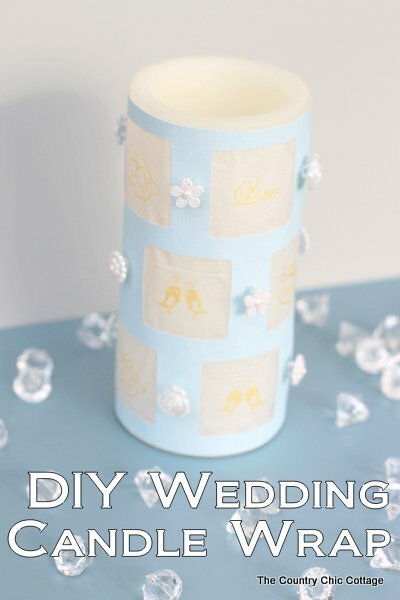 Then come back and make these great candle wraps for decor at your wedding. 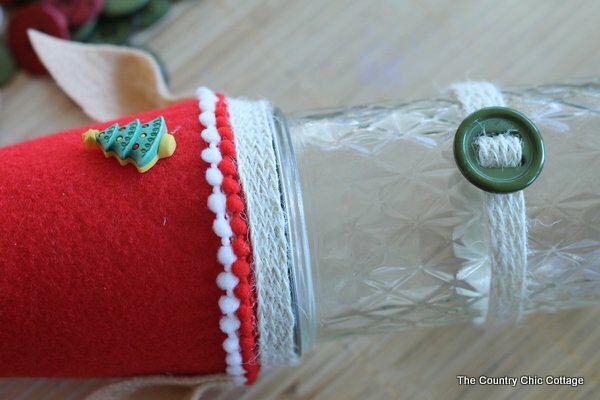 This candle wrap and another version were originally posted over at Buttons Galore and More but I wanted to be sure to post it here in case you missed it. Catch up on Craft Lightning with round ups from day 1, day 2, day 3, and day 4. Cut a sheet of paper so that it fits your candle. 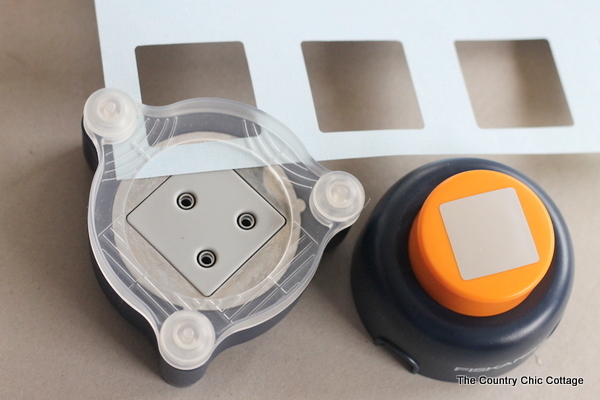 Punch out a pattern of windows in your scrapbook paper with the Fiskars Everywhere Punch. 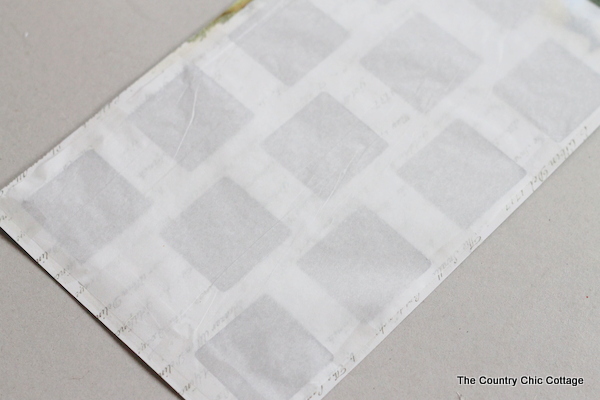 Cut a sheet of tissue paper slightly smaller than your paper and tape to the back. 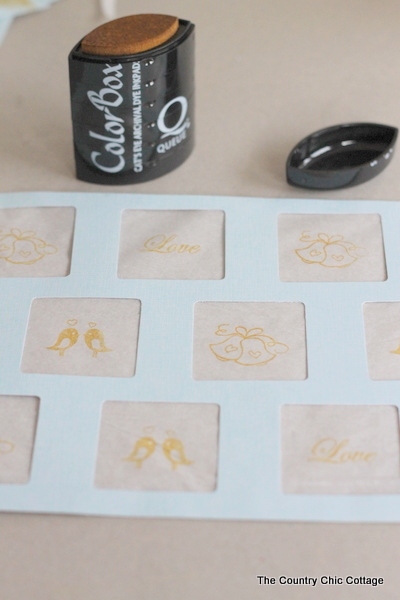 Use various stamps to decorate each window of your candle wrap. 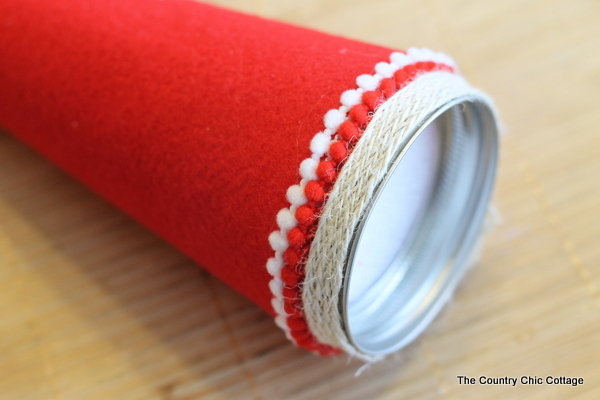 Wrap the candle and secure with tape in the back. The candles I am using are wax sleeves that accept battery power tea lights. There is no threat of fire when using these types of candles. 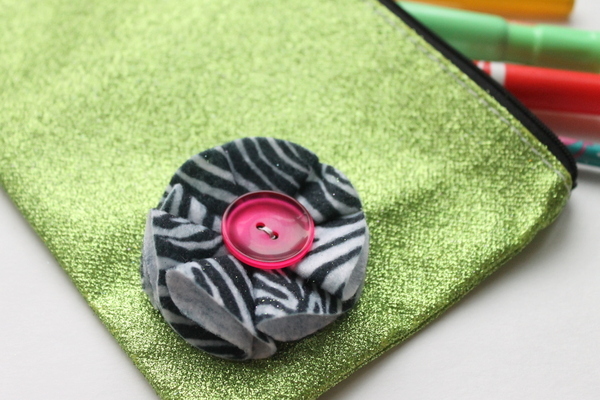 Add random buttons from the Something New button pack around your candle wrap. 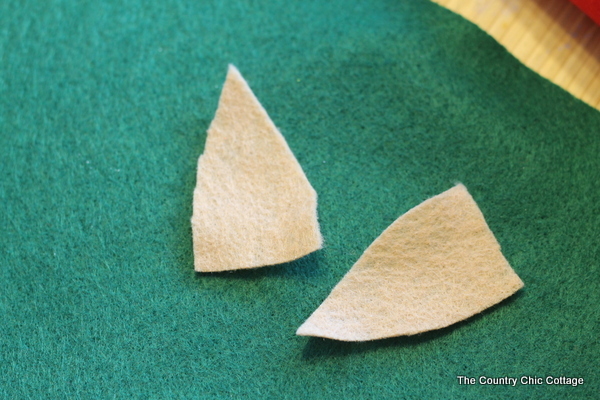 Use hot glue to secure your buttons. 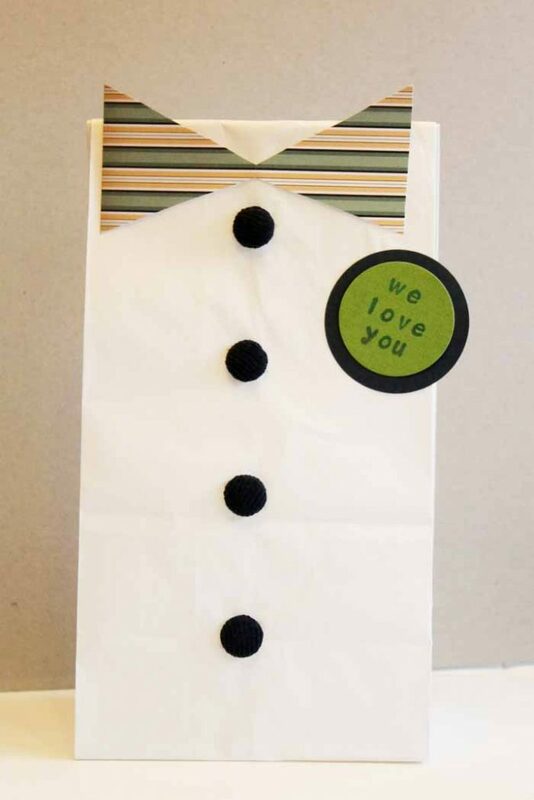 Add a collection of these to your reception tables. 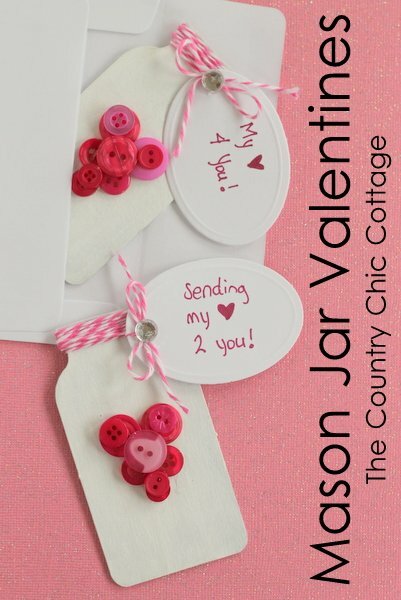 Make them in various sizes for a stunning display. 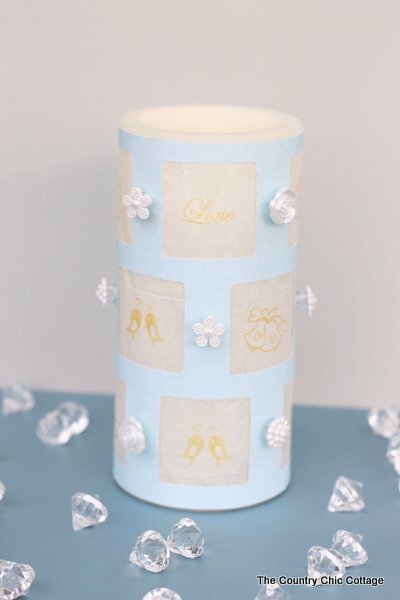 Your guests will marvel at your skills once you make these great DIY wedding candle wraps. Grab your buttons and get started today. 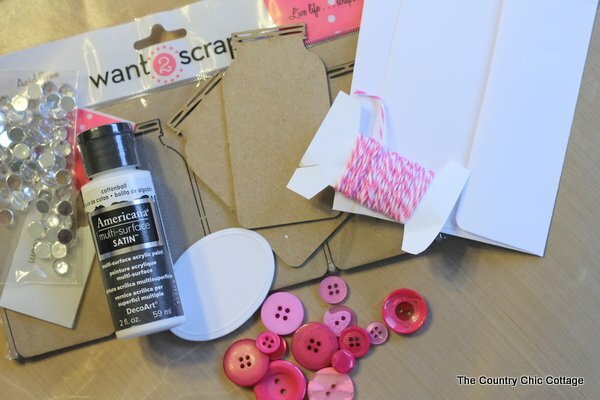 Don’t forget to link up your quick 15 minute crafts to the Craft Lightning linky party and stay tuned right here all week for lots of easy craft inspiration.